how do you say let's go..." in Italian? what means let's go..." in Italian? ...andiamo?, ...andate? or was it perhaps vanno? "wir werden uns treffen" or "wir würden uns treffen"
...what was the difference again? ...and what about the Subjunctive? or the Passive voice? 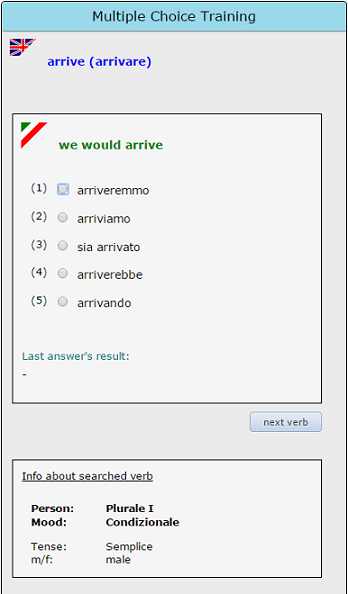 ...and Coniuno is the software that makes you easily learn to conjugate them! 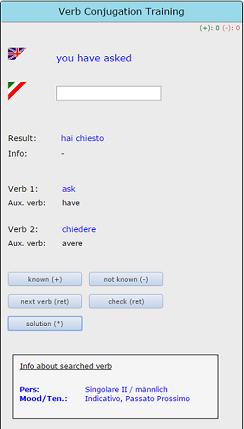 Coniuno is a program for learning and improving your abilities to do verb conjugations (e.g. "I go", "we swim", "they run", ...). Instead of simple memorisation, this is achieved by naturally developing and strengthening your linguistic sensitivity for the respective language. Vocabulary (e.g. "the house", "the wall", ...) can be memorised or they can be remembered in combination with short sentences (like e.g. "this is a big, red house"). But if one tries to remember all verb forms of the most important verbs in this way, then soon this method will not work anymore. And even if one restricts herself to the essential cases, then still there are about 40 verb forms remaining (in present, past, future, conditional etc.). But now imagine a friend of yours would present you every evening for about 15 minutes continuously different verb forms in your mother tongue. Your job would be to translate these verb forms into the corresponding training language, means e.g. "I go" => "vado", "you eat" => "mangi", "you write" => "scrivete", "you laugh" => "ridi" etc. And you would be surprised how suddenly the various verb forms will naturally come to your mind when using them in sentences, just because you have trained your sensitivity for the language and have understood how to build verbs as such. And this is exactly what Coniuno does. For 200 regular and irregular verbs, as well as for your own, personal verbs, that you can group in training packages as you wish. This module provides you with the optimal training opportunity to learn verb conjugations, improve your verb conjugation skills and to get know new, unknown verb conjugation forms. And that within the shortest time possible. Define which languages shall be used for training and which tenses you want to consider in the training session. Furthermore, define if the training shall use randomly selected verbs from the 200 Coniuno default verbs, or if the training shall be done using your own, personal verbs. For example, do a training session from English to Italian, only considering present and past tense, or from English to Spanish, only using the conditional forms. Coniuno will continuously present you the already conjugated forms in your mother tongue and you need to respond with the respectively correct solutions. You can also make the training a bit more comfortable, first have a look at the solution, and then mark the verb accordingly, as known or not known. Coniuno Module "Multiple Choice Training"
This module offers the optimal opportunity, to do some short verb conjugation training, e.g. 10 minutes in the evening, right before calling it a day. Start the Multiple Choice Training and try to recognize the correct solution of e.g. the next 20 verbs. Coming along with that, get to know new, unknown verb forms, like for example the subjunctive forms, which often only come to a later point of time, when learning a new language. Or just enjoy the training and have some fun to see new verbs and their according conjugation forms. Like in the “verb training” module, you can define the languages and the tenses that shall be used for training. By that, for example, continuously improve the usage of plural II, by always recognizing only the plural II form in the possible solutions. And that from all 200 default verbs or while using your own, personal verbs. 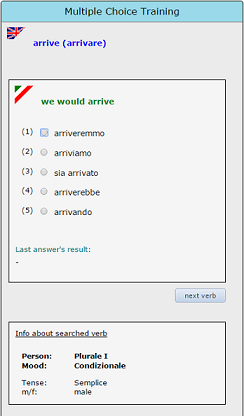 You can also use Coniuno as a library for arbitrary verb conjugations. Just enter the respective regular or irregular verb and you will receive all conjugation forms in an instance. In addition, define whether the verb shall be built in active or passive voice or if it is following male / female forms. Alternatively you have the Coniuno verb tables at your disposal. Here you will find beside the regular building rules, also the rules for irregular verbs, as well as special rules for building verbs in reflexive forms or passive voice. Use the verb tables as a handy tool for daily work. 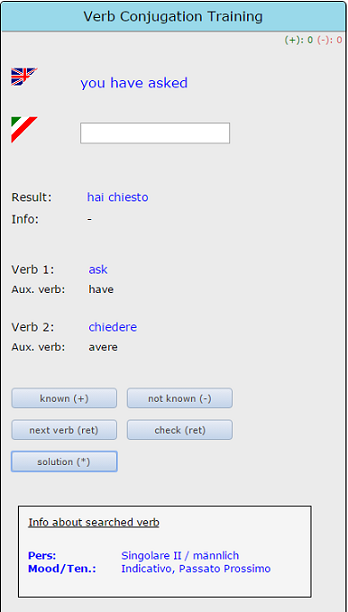 In the licensed Coniuno version, you will receive the verb tables for installation in your Coniuno PC version. By that you can check the respective current training verb in the verb table by one simple key press. In addition to the multiple choice training, the verb training, and the verb conjugation tables, you can train the verb forms for all singular / plural forms of the verbs. Furthermore you get access to the many settings for the available tenses and other options to fine tune your training. And on top of that you have statistics functions, get verb card boxes, and have the possibility to use own verb lists, export / import those lists and get an Infinitive search for unknown verb forms. For further information on the PC version, please see the Coniuno presentation. Coniuno is using PayPal as option to obtain the full version.